MedMeasure is designed to allow patients, healthcare providers, and people in general, to make highly accurate LENGTH and ANGLE measurements of anything they wish – from medical measurements of areas of the body, to everyday objects of interest, using just a camera image. Imaging and measurement of the body can be made with convenience and privacy, at home. With MedMeasure, you save and share your measurement images with your doctor and/or care provider, researchers, and friends. 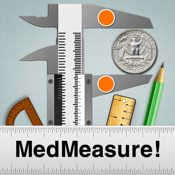 MedMeasure was made for clinical and basic science research, and, to help people communicate measurements of the world around them! 5. MedMeasure includes a list of the diameters of common currency (3 coins and 1 banknote) from over 35 countries! • Read the Tutorial materials provided to learn more about additional functions and how to optimize measurement accuracy!